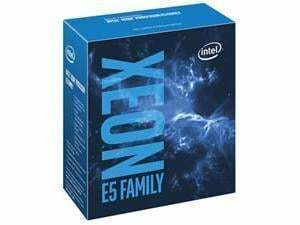 The Intel® Xeon® processor E5-1600 v4 product family-based professional workstation is ideal for demanding workloads and efficient multitasking. With greater compute and memory capacity than its previous generation of single-processor-based workstations, the Intel Xeon processor E5-1600 v4 product family offers excellent performance for advanced model generation and complex applications. The processor also features Intel® Turbo Boost Max Technology 3.0 providing an extra performance boost to frequency-bound applications. - Intel® Advanced Vector Extension 2.0 (Intel® AVX 2.0) supports wider vector units and new instructions to perform more work per clock cycle. - Intel® Hyper-Threading Technology doubles the number of execution threads to increase processing efficiency and overall performance for complex workloads including financial analysis such as Monte Carlo* simulations, ray tracing and rendering, and digital prototyping. - PCI Express 3.0 Interface offers up to 8GT/S for fast access to peripheral devices and networking up to 40 lanes5. PCI Express ports can be configured as 1x16, 2x8, or 1x8 and 2x4 depending on the motherboard designs. - Intel® vPro™ Technology enables organizations to efficiently and securely manage their workstation client environment the same way they manage business client desktop solutions. Intel vPro technology protects workstation assets through hardware-enhanced identity protection, theft protection, and execution protection. - Intel® Turbo Boost Technology 2.0. - Intel® Virtualization Technology (VT-x). - Intel® Virtualization Technology for Directed I/O (VT-d). - Intel® VT-x with Extended Page Tables (EPT). - Enhanced Intel SpeedStep® Technology. - Intel® Demand Based Switching. - Intel® Identity Protection Technology. - Intel® AES New Instructions.